These are the recommended feeding amounts based on the ideal body condition for adult cats of various weights. Individual cats’ energy requirements may differ. Adjust the amount fed to obtain or maintain your cat’s optimum weight. Keep fresh drinking water available at all times, provide plenty of exercise and see your veterinarian regularly. Feed alone or mix with MAX™ CAT Adult Roasted Chicken Flavour Dry Adult Cat Food or any high quality dry cat food. If feeding alone, feed 1 can daily per 3 pounds of adult body weight. Refrigerate unused portion for up to 3 days. Re-feed at room temperature. Adjust as needed to maintain optimum adult body weight particularly when offering with dry cat food daily. Provide fresh drinking water at all times. 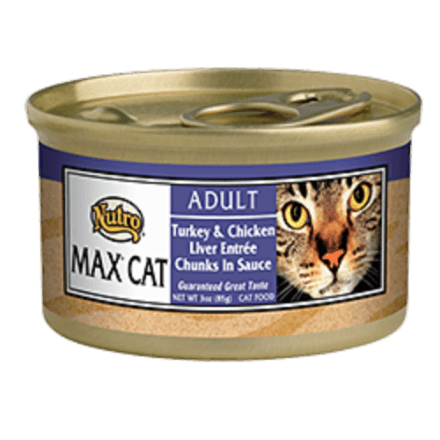 NUTRO™ MAX™ CAT Adult Turkey & Chicken Liver Entrée Chunks in Sauce Wet Cat Food is formulated to meet the nutritional levels established by the AAFCO Cat Food Nutrient Profiles for adult maintenance.